Bay Growers Inc. is one of the newest storage and pack house in Canada and the first in eastern North America to utilize a pre-sort system, which allows us to meet size and color specifications more readily and efficiently. In 2013 we have fully upgraded to the newest technology that MAFF has to offer. This along with multiple dedicated packing lines allow us to react very quickly to large and/or late orders. This system also allows us the luxury of not carrying large inventories of packed fruit. Bay Growers is a pioneer in the utilization of Smart Fresh in Canada. Ninety percent of the stored fruit is Smart Fresh treated, making the finished product crisp and flavourful, with an eye appealing appearance. After traveling through a nylate-treated water bath and under high-pressure washers, apples enter the pack house. 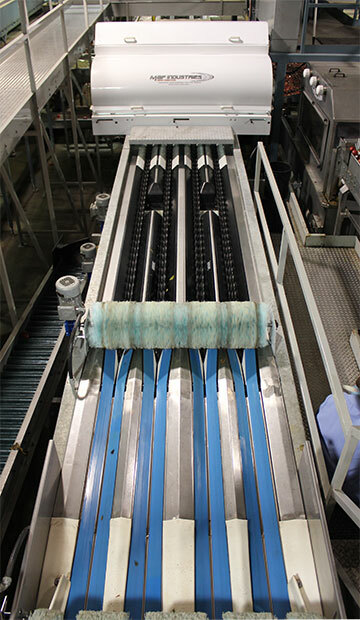 Leaves are removed, and brushes dry the fruit before it reaches the optical sorting and grading equipment. 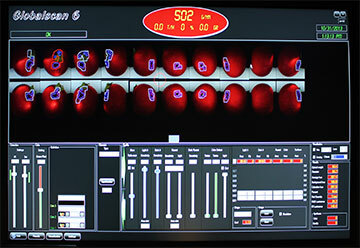 Pre-sizing diverts unwanted fruit and composite grades to separate lines, while the remaining apples pass through color and infra-red cameras on multiple lanes. Forty individual photographs of each apple are evaluated by computer, which then diverts it to tray lines and rotary dry bin fillers. This technology allows us to pack a combination of 24 different color types and sizes. Each grade is treated with the same care. Apples are placed gently into bins to avoid bruising. Once the fruit is trayed and packed into cartons, a robotic arm lifts and stacks each carton gently onto pallets at the rate of a thousand cartons per hour. From here, pallets move to a strapping line capable of straightening, bracing and strapping 20 pallets per hour. Evenly-stacked and vertical pallets minimise problems during the loading and delivery process. During the off-season, the pack house undergoes three weeks of mechanical maintenance and cleaning. This strict maintenance schedule minimizes the risk of mechanical breakdowns during peak season. Our BRC-accredited pack house has the capacity to pack over a million cartons annually.